Gardening is a rewarding hobby, but it’s not always easy. It’s also not always cheap. I tend to enjoy my hobbies much more when I figure out a better way. 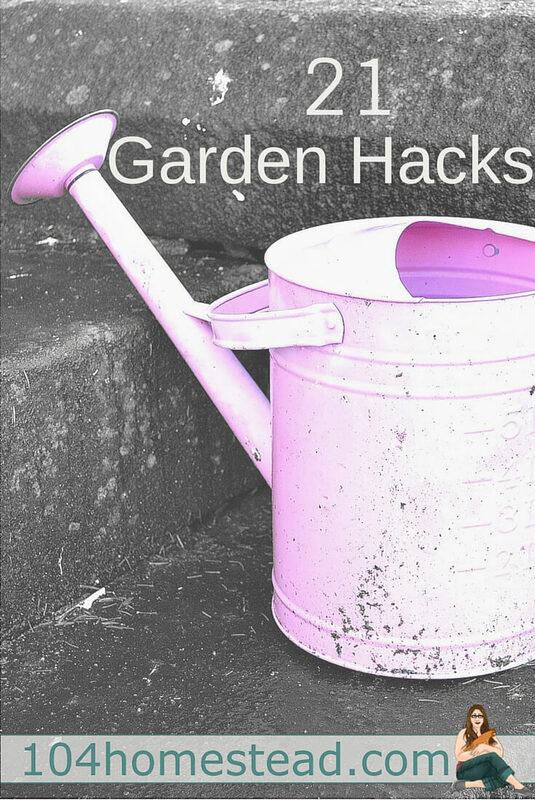 So, as the last hack post of the week, I give you Gardening Hacks. I am sharing my top ten favorite tricks that I’ve picked up along the way, as well as several from some of my amazing blogging friends. Lay them out on a sheet of newspaper on the seat of your car. Leave them there with the windows up and they dry quickly and evenly. Plus, your car will smell nice. This works even better than using warm on the oven, which often over-dries them. Just remember to close your windows when you drive with them. Often times it’s loaded with great nutrients, so why would you want to dump it down the drain? I keep a 5-gallon bucket handy in the kitchen to dump recycled water and every morning I use it to water the plants. 1 part white vinegar/1 part rubbing alcohol/1 part water ◄ all you need to get salt residue (the white stuff) off of terracotta pots. Choose native plants for your gardens. 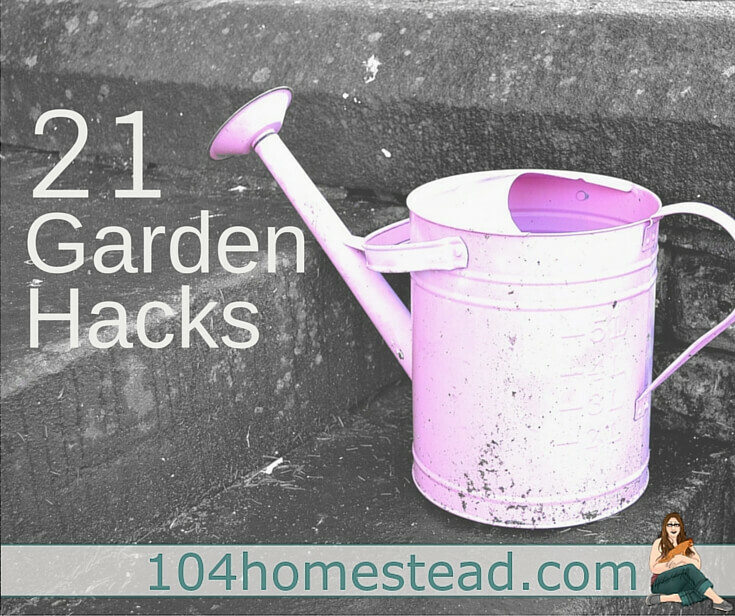 They cost less (or may even be free if you can find cutting or seeds) and because they are from the area and are accustomed to local weather, they should be low-to-no maintenance. Upcycle what you have for your garden. A screen door can be an excellent trellis. Fallen tree limbs make great bed borders. Old windows serve an excellent second purpose as a cold frame. Scratch a bar of soap before gardening to prevent dirt from getting under your nails. When you come in to wash your hands, under your nails will be sparkly clean. Water garden beds in the morning and potted plants in the afternoon. Potted plants tend to dry out quickly in the late afternoon sun. By watering in the afternoon, you are loading them up so the water is handy during the worst of the temperatures. Garden beds need time to absorb water before the noon heat arrives. By watering in the morning, water has a chance to soak down to root level. Use your shovel as a measuring tape. Lay out your shovel next to a yard stick or measuring tape and mark the feet and inches with a permanent marker. When you are working on a project you won’t need to stop and go find the measuring tape (which is never where you left it). Create a rain barrel to help with watering. This is especially important if you pay for water. Be sure to check with local code enforcement before harvesting water. Some places can be weird about that stuff. Save nursery pots to protect small plants when you have an unexpected frost. Just put the pot over the plant and it will help shelter it. Nursery pots are also great for marking the location of plants like hostas that die back, so you don’t accidentally disturb them in early spring. Make your own seed mats to save time planting and remove much of the hassle of planting tiny seeds at precise distances. Grow a Good Life will show you how. Adding Hose Guides to your garden beds prevents you dragging the hose across delicate plants when you’re watering. Saving seeds from the previous year’s harvest is a great way to save money. It’s also really easy. The Homestead Lady explains how to do it with tomatoes and Better Hens & Gardens shows the steps for beans. Who Knew? says bungee cords keep the bags in place when you’re using those big trash cans. This is brilliant when you’re raking leaves. You can save a lot of time and energy by researching different ways to garden specific crops. This Lazy Bed method for growing potatoes is a great example. Pre-sprout your seeds to save yourself the insanity of waiting and hoping. Grow a Good Life explains it here. If you’re allowed to play with fire (I’m accident prone…), here is a tool to remove weeds that received great reviews. Cooking spray is the answer to mowing a wet lawn. Did you know you can make your own soil blocks? Soil blocks are a great way to do your seedlings. Find out about making your own at Grow a Good Life. Sheer curtains and shower doors in the garden? What is Everything Home with Carol thinking? She’s thinking of even more ways to save money. Have you had an Ah-Ha! moment gardening? Share your trick here or join in the discussion over on our Facebook Page. Oh I love the one about the soap under the fingernails! I have another tip: Grass clippings from mowing make great mulch and natural fertilizer around plants or anywhere you want mulch. They decompose quickly, but you can add more every week. I got this tip from a master gardener I know. He even goes as far as picking up all the neighbor’s bags of grass clippings! Think how much this tip will save you on buying those large trash bags! I love the soap trick for keeping my nails clean. Great tips! Great tips, the about drying herbs in a car, we used to do it in an old truck and it worked perfect. Great tips! I never thought about using cooking water to water my house plants, but that is a great idea that I am going start doing. Pinned & tweeted. Visiting from the Homestead blog hop. Great tips. I never thought about saving my cooking water to put on my plants but that is a great idea that I am going start doing. Tweeted & pinned Visiting from the Homestead Blog Hop. Ooh, excellent. I particularly like the herb drying tip (I imagine my car will smell good as an added bonus!) and the soap under the nails. Dirty hands are something I had to put up for a good 3-4 days after weeding, so I’ll definitely try the soap trick. Thanks! So happy to help Wendy! Thank you for reminding me to use the heat in my car for drying herbs! I always run out of space by the end of summer! Love the tips, especially #8 : “Use your shovel as a measuring tape.” … I have done this … I have marked my shovel with measurements … it works great. Great post! I’m all over the soap under the nail thing! Thanks for sharing these tips. I am always looking for ways to make my work on the farm easier and cheaper! Some great tips! I love your cooking water idea.